This is famous Ghantai temple situated at Khajuraho district Chatarpur Madhyapradesh.This temple was built around 10 century AD by Chandel kings of Khajuraho. This temple is situated in eastern group of Temples in Khajuraho.This temple is situated outside the boundary wall of Jain temples. This temple is very remarkable for it's art and craft. Initially this temple came into light after survey of Alexander Cunninghum.He concluded about this temple as a dilapidated Buddhist shrine.In 1876-77 a Joint survey by Alexander cunninghum and Ferguson was done for this temple and finally they both concluded this as a Digambar Jain temple of 10 century AD.This name Ghantai was given to this temple in ancient time due to it's Pillar where marvelouly carved bells and chains are visible. 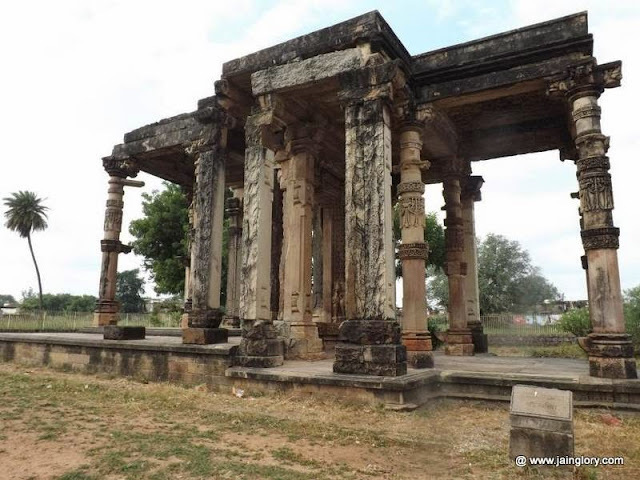 These pillars are considered under the most beautiful pillars of central india.Now a days only Ardha mandapa and mahamandapa are remaining in this temple. We can just assume about grandeur of this temple.It was bigger than Parshwanatha temple situated at Khajuraho.This temple was dedicated to lord Rishabh as Chakreshwari is seen in this temple along with Nine planets and Gomukh yaksh.